You are here: Home / Cloning vMA still not supported? 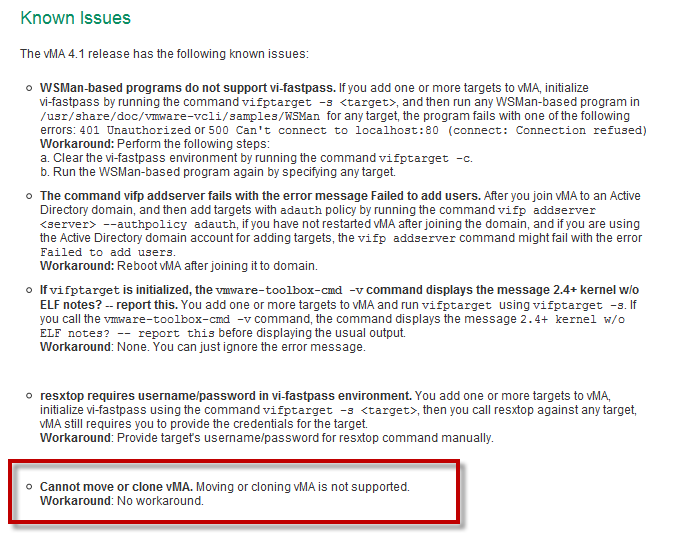 Cloning and/or moving vMA is not supported by VMware, this has been the case since VIMA 1.0. If you take look at the "Known Issues" in the vMA release notes, you will see there is no still workaround. Users may find it useful to be able to clone vMA for backup purposes or to deploy another vMA without having to re-download or re-uploading .OVF from your local desktop/VMware's website. If you ever tried to clone VIMA 1.0 and boot the system up, you will notice a warning message during the init process when vMA verifies the system's UUID. If it detects that it has been cloned, it will actually disable itself and makes the vMA components unusable until you reinitialize vMA using vimaclean. This is still the case with vMA 4.1, except the vMA components are no longer disabled when you perform a clone. You will just see the warning message during the init process, but all functionality continues to work. Before the vMA specific components starts up, it makes a call to /opt/vmware/vma/bin/verifyuuid. It verifies the system UUID which you can extract using dmidecode, this is the same UUID found within the .vmx entry called uuid.bios. When you clone a VM, a new UUID will be generated which causes an issue when it tries to verify. Prior to vMA 4.x, VIMA 1.0 stored all it's configurations within a set of XML files located in /etc/vmware/viconfig, these files held the config for both the vi-fastpass targets and vilogger config and policies. With the release of vMA 4.0, these configurations were migrated to a sqlite3 database which is stored in /var/opt/vmware/vMA/vMA.db. Within this database, it also stored as the old flat file configuration, the system UUID of vMA. This is what verifyuuid was checking against to see if it was cloned or moved, you can actually query the vMA DB to extract this information using a simple SQL query. To resolve the warning message, you just need to update the new UUID in the vMA DB using an update statement. I suspect that VMware may have allowed cloning of vMA, but just did not update their release notes? The only thing you have to do is manually fix the UUID if you do not want to see the warning message. If you would like to fix this for VIMA 1.0, you will need to do the same thing except you need to modify the UUID found in /etc/vmware/viconfig/viconfig.xml and restart vMA for the changes to effect. Here are some additional steps by which you reset the vMA (version 4.1) to first boot state. You can use this approach to install additional software/agents on the vMA, and then make this modified vMA as a ready-to-deploy appliance. i use this approach to create a vMA with HP operations agent pre-installed during the ‘first boot’ itself. 1. boot up the vMA ovf in the normal mechanism, provide IP address if required or feel free to use DHCP or no networking. 2. as root, install the additional software – such as HP Operations Agent. 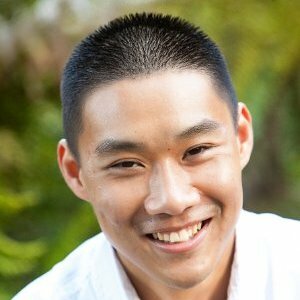 3. continue logged in as root – then reset the appliance back to first reboot context – this is done by a hack. create the folder ‘/opt/vmware/vma/VMWARE_VMA_FB_REQUIRED’. presence of this folder ensures that on next reboot, the initial set of installation questions are raised. 5. remove settings from /etc/sysconfig/network file. 7. modify vmware-vma init script (it is present under the rc scripts folder) to call the updatevMAUUID.sh script that William provides above. 8. save the vMA as an appliance with the above config changes done. you can use ovftool for this or you can do this via VI client UI. same steps for vMA version 5? Is the above download link now working..? I tried your script but unfortunately it won’t work on my vMA 4.1 VM. If I do all the above desrcibed steps by hand, all works well.